Some of the most frequently asked questions about our Used Armored Vehicle Services, and more, can be found here. Any type of used armored car or used armored vehicle is available here including bulletproof trucks, tactical trucks, prisoner transport and money transport trucks, used SWAT vehicles, and more. Our inventory includes Ford armored trucks, General Motors armored trucks and other great names. For the best in used armored trucks and cars consult The Armored Group. Our used armored cars and used armored trucks come from dealers across the spectrum including Ford, General Motors, Mercedes, BMW, and others. Here you'll find bulletproof trucks, tactical trucks, used SWAT vehicles, prisoner transport and money transport trucks from all of these leading names and more. Let The Armored Group introduce you to our used armored vehicles. We offer both used prisoner transport vans and used prisoner transport trucks as part of our line of used armored security vehicles. 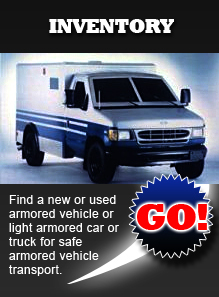 In addition, we feature bulletproof trucks, used armored SWAT vans and more from such names as Ford and General Motors. Learn more about the great armored cars, armored vans, and armored trucks available at The Armored Group.